The larger the lettuce leaf, the easier it will be to contain the ingredients, so in this case, bigger is better. Select lettuce leaves no smaller than the palm of your hand. If the lettuce has a large center rib, work with it, not against it, when folding the lettuce around the fillings. Sometimes the lettuce can produce small gaps and holes from which yummy things could escape when it’s rolled or folded, so lettuce wraps need to be constructed differently than a sandwich — you’ll need a food barrier as your next layer, which will hold everything else in place. A slice of cheese, meat or another layer of lettuce will do the trick. Whether you’re a garden vegetable enthusiast, an egg salad kind of person, baba ghanoush lover, or fish tacos are your thing, once your barrier is in place, you can pile on any filling. If you’re into dry lettuce, you can skip this part. But, if you’re looking for ways to infuse more flavor, mix up a batch of fresh mayonnaise, a simple vinaigrette, or a honey mustard sauce, and generously dribble over the filling until you’ve created a fine mess. Okay, so let’s recap: Choose your lettuce, create a barrier, pile on the fillings, sauce it. Easy. 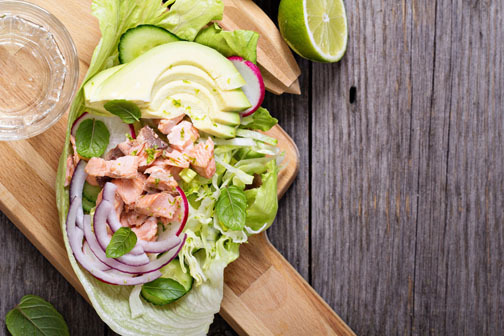 Iceberg lettuce, pickled onion and radish, cucumber, avocado, poached salmon, fresh mayonnaise (pictured above). Butter lettuce, shredded carrot, sweet potato, and red cabbage, toasted poppy seeds, raw honey vinaigrette. Butter lettuce, chopped hard cooked egg, toasted black sesame seeds, arugula, sliced radish, sesame oil vinaigrette. Blanched collard greens, julienned pickled carrot, zucchini, and red beets, broccoli sprouts, mayonnaise. Romaine lettuce, chicken salad, micro greens, shredded green cabbage, minced red onion. Butter lettuce, sautéed ground beef with allspice, minced red onion, honey mustard, shredded red cabbage. What’s your favorite way to eat a lettuce wrap?